Having a mix of different Goldfish varieties in a large aquarium is one of the pleasures of keeping Goldfish, but are all the varieties thriving? A member of a Goldfish group on Facebook was concerned about her Water Bubble Eye that appeared to have a swim bladder problem, as it was bouncing on the surface like a cork. I was curious about this because as a breeder of Water Bubble Eyes, I know swim bladder problems aren’t generally a concern because their bodies are relatively long, so their swim bladders aren’t as distorted as in some deep bodied varities. The first thing I noticed in the video was the other varieties in the aquarium. All were normal eyed goldfish. The second thing I noticed was as the owner was feeding the fish using some sort of feeding tool, the fish was nearly jumping out of the water to get to it. This told me the problem wasn’t a swim bladder issue, it was starvation. When a Goldfish isn’t getting enough food, it will gulp down any food it does get as quickly as possible. If the food is on the surface, it will gulp down air with the food. • Size - larger fish will dominate a feeding circus. This is less of a problem with Goldfish because they can only fit so much into their mouths before they need to stop and chew before getting another mouthful. Larger fish just take more of the available food and leave the scraps for the smaller fish. • Eyesight – Apart from telescopic eyed fish, other varieties can have impaired eyesight. The two obvious varieties are Celestials and Water Bubble Eyes. Varieties with head wens (growths) such as Ranchu, Lionheads and Orandas can all have impaired eyesight when their wens are particularly heavy. • Fin Development – Any fish with two caudal fins is at a disadvantage to single tailed varieties. If the fins are long and flowing, that increases the disadvantage. Comets and Shubunkins with their longer fins don’t seem to be any slower than those fish with shorter fins. • Body shape – The deeper the body, the less ability the fish has too swim quickly. An extreme example of this is Pearl Scales that can have bodies resembling golf balls. One of the obvious ones is a fish just doesn’t seem to be growing compared to its tank mates. Usually it is the Black Moor in an aquarium full of normal eyed fish. When any animal is under-nourished, nature presumes it is caused by either a physical handicap, or there isn’t enough food available. The immune system of the fish becomes weakened and then it succumbs to some opportunistic disease. Abnormal behavior after feeding usually takes the form of a fish becoming full of air in the intestinal tract. Some fish will do this normally, but if you have a fancy variety exhibiting this behavior and it appears under-nourished, suspect there is too much competition for food. 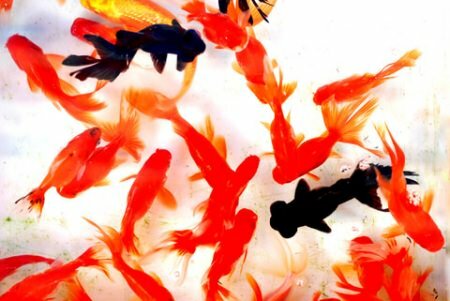 Because you may already have an aquarium full of Goldfish, and you now know the variety mix isn’t ideal, what options are there to make sure all members of the aquarium are getting their fair share of the food? • Hang green food in the aquarium. Provide enough so that it will take a few hours for the fish to eat it all, giving the slower fish time to get their share. • Divide off the aquarium during feeding. Use a piece of acrylic or something similar to separate the most vulnerable fish from the more active. This is only practicable with small numbers of fish. • Hand feed your fish. Goldfish can easily be trained to accept food from your hand but it does slow up feeding. • Feed a gel food and stick it to a flat rock or something similar. Always keep it in the same place as Goldfish are quick learners and will start gathering around the regular feeding spot. Having an aquarium with different Goldfish varieties in it is fine as long as they can all compete equally for food. If there is a variety you are particularly fond of, but you know it won't be able to compete as successfully for food as the other inhabitants, you will have to make separate feeding arrangements for that variety. Why Goldfish and not tropicals?